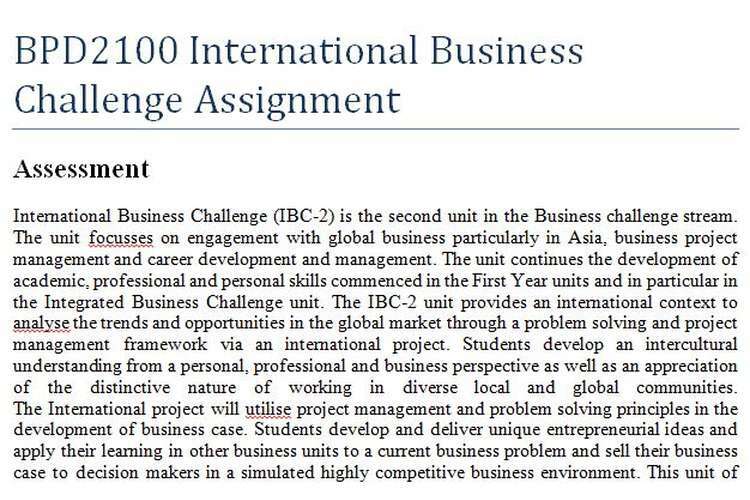 BPD2100 International Business Challenge Assignment is the second unit in the Business challenge stream. The unit focusses on engagement with global business particularly in Asia, business project management and career development and management. The unit continues the development of academic, professional and personal skills commenced in the First Year units and in particular in the Integrated Business Challenge unit. The IBC-2 unit provides an international context to analyse the trends and opportunities in the global market through a problem solving and project management framework via an international project. Students develop an intercultural understanding from a personal, professional and business perspective as well as an appreciation of the distinctive nature of working in diverse local and global communities. The International project will utilise project management and problem solving principles in the development of business case. Students develop and deliver unique entrepreneurial ideas and apply their learning in other business units to a current business problem and sell their business case to decision makers in a simulated highly competitive business environment. This unit of study expects all students to utilise knowledge from a broad range of other discipline areas including, business analysis and management, operation management, project management, business economics, marketing, human resource management, accounting, finance, business law, information technology, corporate social responsibility (CSR) and ethics management. Students commence the development of a career portfolio that involves designing their career plan, CV and a professional webfolio which can be used to market students' skills and abilities to prospective employers. This enables students to evidence the incremental growth of their interrelated business and professional skills. The unit is based on an action learning model which aims to continue to develop students' skills in critical thinking, problem solving and collaborative working through group and teamwork, interactive class-based activities, team-based projects and a case study approach to business issues. Students in this unit are expected to work in diverse team environments, while developing beneficial lifelong skills such as organisational skills, conflict management skills, problem solving skills, research skills and communication skills. Scrutinise organisations and communities, with initiative and judgement to identify international business challenge and opportunities. Contextualise and apply business research skills including data collection, analysis and evaluation of business information in an international setting. Creatively scope, design, implement and monitor business-related action plans, strategies and projects that would contribute to professional practice and address international business problems. Exemplify effective interpersonal and professional collaborative skills and intercultural understandings to respectively manage team diversity and effectively deliver intended business outcomes. Reflect upon the effectiveness of interpersonal, professional and business skills to plan and monitor the development and management of relevant skills and attributes in a changing international business environment. Select and justify the selection and structure of evidence to substantiate the design of an effective, coherent career plan within a career ePortfolio. Cogently argue the effectiveness of a business pitch through corroborating evidence in an oral presentation to a variety of audiences.